The Vela ventilator system is an easy to use, self-contained, servo-controlled, software-driven ventilator. It has a dynamic range of breathing gas delivery that provides for pediatric through adult patients. Its revolutionary user interface provides maximum flexibility with simple operator interaction. 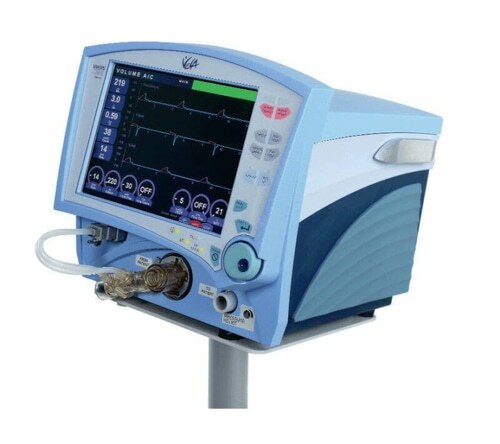 It has a flat panel color LCD with real time graphics display and digital monitoring capabilities, a touch screen for easy interaction, membrane buttons and a dial for changing settings. A precision gas delivery turbine with servo controlled active inhalation and exhalation improves performance over previous generations of ventilators. The Vela may be configured as a conventional ventilator or non-invasive positive pressure ventilator (NPPV). It has been designed to function using most commonly available accessories; there are no proprietary circuits required for your Vela. It is easy to clean and its design does not allow liquids to pool on its surfaces, reducing the likelihood of fluid leakage into the body of the ventilator.